Exceptionally good value, home cooked delicious food. Little Miss Piggies is a small, independent family run cafe located on the upper end of St James’ Street in the midst of the characteristic Kemptown. 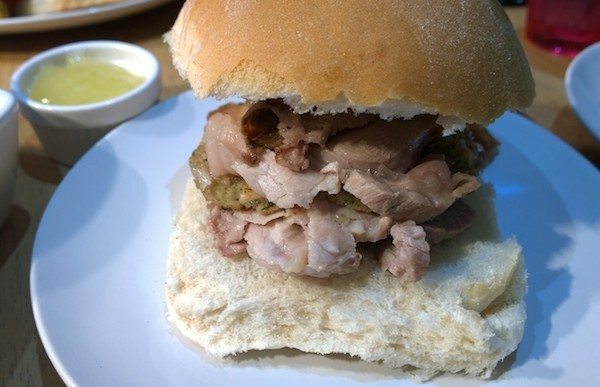 Specialising in traditional English breakfasts and delicious home roasted pork, Little Miss Piggies offers comforting, home cooked meals without the hassle of having to cook it yourself! 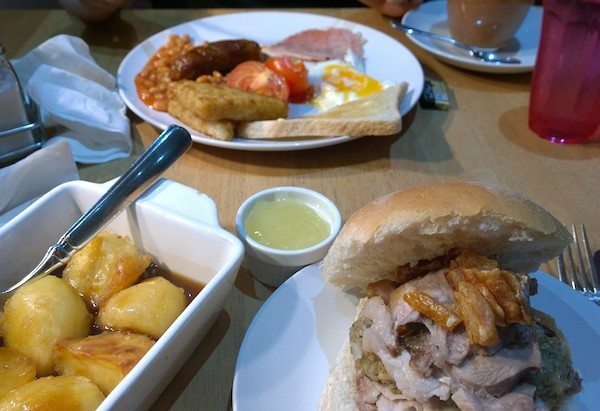 These include: full English Breakfasts, sausage or bacon rolls, pulled pork sandwiches, Piglets Pantry pies, omelettes, or even a full roast pork dinner if that’s what you were feeling like on the day. There are plenty of vegetarian options too if you prefer. Myself and a friend were visiting just before midday on a Saturday, Kemptown was buzzing and there was a brisk Autumn chill in the year. We found Little Miss Piggies, and went inside, hanging our layers and coats on the stand by the door. It is a very small little cafe, but once you are seated and settled, you soon forget about the size of it and feel right at home. We were sat right up at the counter next to the warm lamps, where the freshly cooked pork was smelling very tempting, and we were brought the menus to look over and offered a drink. We both went for standard breakfast teas, as it was that kind of day outside, and it felt like the right time and the place. 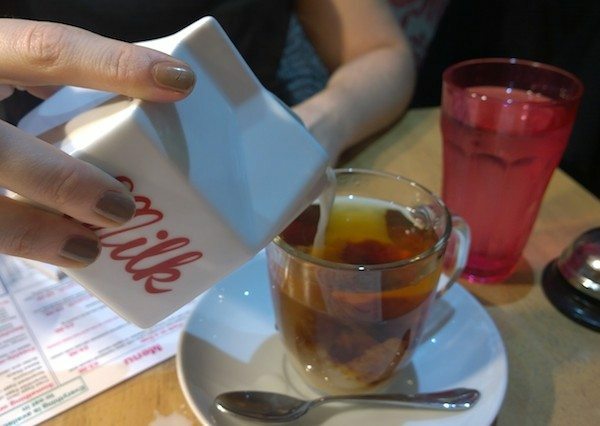 They also serve a range of herbal teas, juices, soft drinks and coffee, from the local roastery called Drury. 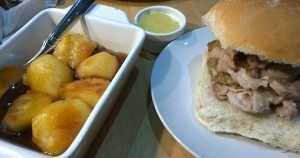 It didn’t take me very long to decide what I wanted, as even though I hadn’t had breakfast yet, I just couldn’t resist trying the roast pork. I ordered the roasted pork in the bun with stuffing, crackling and apple sauce with a side of the roasted potatoes with gravy. My friend decided to build her own breakfast made up of bacon, premium sausage, tomatoes, beans, egg and toast. 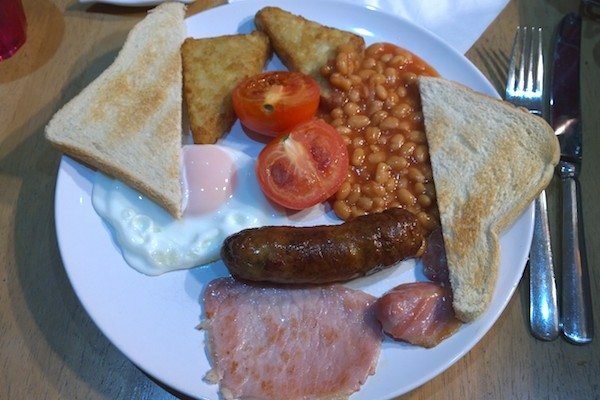 Everything on the menu is very reasonably priced – you can get an English Breakfast for just £3.95! As we were waiting for our food to be made, we noticed a man coming in for a takeaway roast dinner, a couple of girls getting takeaway sausage baps, and then a group of lads coming in for Full English Breakfasts to start their day; proving that the cafe was popular by many for all different reasons, and it felt like your real local, friendly cafe. My friend’s breakfast came out first, shortly followed by my dish of roast potatoes and my delicious pork bun. The potatoes were golden, crispy, buttery and fluffy inside – everything that you would want a roast potato to be. As a Sunday roast lover, I know how hard it is to find a good to perfect roast potato in Brighton, but I have to say that these were near to perfect for me, they were so delicious! 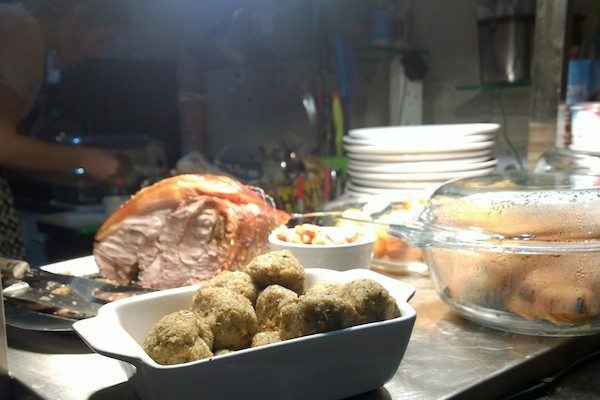 They came served in a small dish with lashings of gravy poured over top. 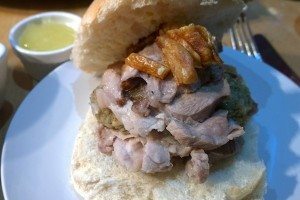 The pork came in a soft white bun, with herby stuffing and crunchy crackling. The pork was juicy and I was definitely glad that I had it when it was so fresh! The apple sauce on the side was tart and slightly sweet, it was all very nice. My friend’s breakfast was tasty and all the components were cooked with care. It was simple food, but done well, and the plate was clear from grease unlike some breakfast cafes that you go to. After our satisfying breakfast/lunch, we said our thanks to the lovely staff and made our way to the door. The cafe had been busy all day with people coming and going, and as I said before, it was a real friendly, homely place. The cafe felt inviting from the moment you stepped in, and with tasty home cooked food that they are offering, it will be hard not to resist to head back there soon. 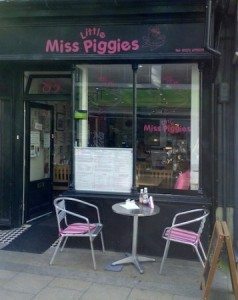 So whether you are looking for a simple, hangover breaky with all the trimmings, or you fancy a quick, hot pulled pork sandwich while on the run, definitely keep in mind Little Miss Piggies while in Kemptown, for their exceptionally good valued, home cooked delicious food!